The 2007 Australian Business and Specialist Publishers (ABSP) Bell Awards were held on Friday, November 23 in Sydney to highlight excellence in business and consumer publishing. We are thrilled to announce that Dogs Life was one of three finalists and received a "Highly Commended Award" for Consumer Magazine of the Year (print run less than 30,000). Thank you for supporting the magazine - together we are making a difference to the welfare of dogs around the country. I've been reading Dogs Life for over a year now, and enjoy every issue! 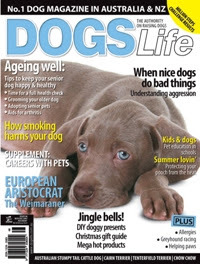 I got some great tips about traveling with dogs from your holidaying with dogs supplement in the Sep/Oct 2007 issue. My kelpe "Baz" is looking for a nice shampoo to keep his coat healthy and shiny. Any advice. Keep your paws open for the March/April 2008 edition of Dogs Life magazine. We have a shampoo roadtest and advice on maintaining a healthy and shiny coat. We roadtest shampoos for all types of doggy skin - perhaps there is one suitable for Baz.